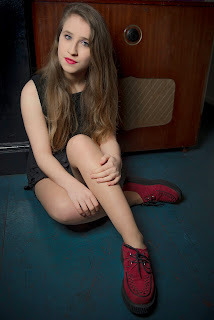 Johanna Alba is just 19 years old and a singer/songwriter from Mannheim, Germany. In 2014 Johanna turned her hobby of making music and song-writing into a job and relocated to Manchester, UK to study at the British Institute of Modern Music. With an impressive track record so far, including winning Germany's most renowned national music contest for both the Pop/Jazz Singing category and another for the interpretation of her own songs. After winning such awards and gaining further press attention, Johanna went on to gain a scholarship and embarked on a music tour around Greece. Not bad for just nineteen, aye? With influence from her family, Johanna has always been around music 'literally from birth', now with the talents to play the violin, guitar and piano and her song-writing falling in place as the last ingredient to making her acoustic act. Other inspiration for Johanna comes from British singer Lianne La Havas who 'Silent Confirmation' was originally written for which Johanna covers on her Soundcloud page. Taking inspiration from Jake Bugg, Sophie Hunger and Wallis Bird and general Jazz singers for her vocal techniques. Gently delicate yet powerful, Johanna's music has a romantic folk overtone. Her acoustics compliment the vocals and lyrics. With 'This Is My Time' as a personal favourite, it's up-beat and empowering feel has you singing along by the end of the track. Johanna is one to watch. Gracing Manchester with her acoustic set, the next gig she will be playing will be on 29th May at Ziferblat Edge St with an acoustic line up to accompany her.